Odorless cyanoacrylates are formulated for use by those persons who have become sensitized or allergic to standard CA. Their use is recommended whenever sufficient ventilation is not possible. Odorless CAs have slightly less strength when compared to standard CA and are much more expensive. They can be used, however, on materials such as white foam that are otherwise dissolved or frosted by standard CA.Super-Gold and Super-Gold+ are odorless Insta-Cure CAs. They are non-frosting and take only 2 or 3 seconds longer to bond. There are no fumes that irritate the nose and eyes. The Super-Golds do not attack white foam- they will not fog clear plastic, either. Super-Gold+ is ideal for attaching clear canopies in plastic model kits- however, Maxi-Cure is still recommended for assembling the rest of plastic kits. Wood can be bonded to white foam with Super-Gold+ in less than 15 seconds. 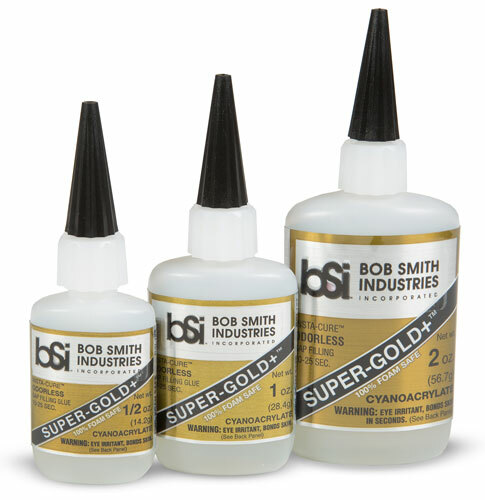 For bonding foam to foam, spray a very light fog of Insta-Set to one piece and apply Super-Gold+ to the other before joining. Excess Insta-Set may create too much heat which can melt the foam.